Storms come on suddenly and have the possibility of turning into monsters. If a person is not adequately prepared, they are gambling with their lives. Prior to any type of disaster, a person should have at least two weeks of food, water and short term disaster supplies in their home for a unforeseen disaster. The aftermath of this storm has the possibility of road blocks due to the snow and flooding coastal water. If the roads are blocked, food and supplies will not be able to make it’s way into the disaster prone area until the snow and ice melt away as well as the downed power lines and debris are removed from the road. On Februrary 9, 2010 the Northeast was hit with a major snow storm. 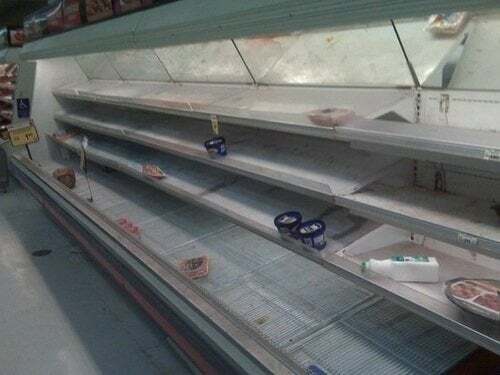 This is what the store shelves looked like then. Let’s hope that many will be more prepared with this round of storms. Although, this author has not endured a snow hurricane, per se, she has gone through multiple tropical hurricanes. The need to be prepared for disasters is vital. A person who waits until the last minute to gather supplies will be one who walks away unprepared and may be lucky enough to leave with a few picked over items. Those that are not prepared should equip themselves with supplies and as much knowledge about the storm they will be experiencing as possible, prior to it occurring. Although a snow hurricane is rare in some cases, it does happen. Those living in the Northeast are typically used to winter storms, but not the severity of this type. Have an emergency plan in place with emergency contacts on alert in the case that a person needs to evacuate their home. If damage to the home makes in uninhabitable, evacuate to a pre-planned friend or neighbor who may be near by. Have some winter disaster supplies in the home such as: candles, matches/lighters, a battery operated radio, emergency food supplies, water, extra blankets, toilet paper, prescription medicines, over the counter medicines, a non electric can opener, infant/baby needs if a child is in the home. Be prepared for the power to go out. Be prepared for this set back by having alternative power and heating sources to go along with the extra blankets. Having an emergency generator with extra gasoline could be a life saver in this situation. Avoid traveling in a blizzard. If a person is on the road when a blizzard hits, look for a hotel nearby and stay off the road until there are better road conditions. Have a 72 hour bag in the vehicle with lots of warm insulated clothing in the case that a person is stranded in their car during a blizzard. Additionally, having an extra supply of gasoline in the car would also be a good idea. If a person is stranded in the car, do not leave the engine running to keep warm. Snow can block the exhaust pipe and fill with the car with fumes, thus causing carbon monoxide poisoning. Keep one window open just a bit to avoid this. Run the car in short bursts to avoid running out of gas. Turn the engine on long enough to keep the car warm and then turn it off. Stock up on shovels and snow removal equipment prior to the storm. Additionally, those who were not hit with the blinding snow flurries, but were effected by coastal water flooding, should read over guidelines for emergency flooding and know what to avoid. Stay inside and stay warm! The winds from this type of storm are going to be extremely dangerous. Snow drift can be a problem after a storm of this magnitude. Additionally, frostbite will be a major concern so a good rule of thumb is to keep everyone inside and warm until the threat is over. If a person must go outside, they should use the layered principle when dressing for the outdoors. Best of luck to those that are going through these torrential storm systems. Stay warm and stay prepared! I have lived in the Northeast my entire life and have been through dozens upon dozens of snowstorms. On top of the Noreasters, snow hurricanes, we also get major lake effect off of Lake Ontario. Being prepared for these storms is something that I have seen becoming less of a priority among my neighbors. In March 1993, we were snowed in for nine days! We got 5 feet of snow that storm. It took us days to hand shovel the road. I think that as weather gets wackier, we are going to need to be more prepared than we have in the past. The Perfect Christmas Gifts - BOOKS!